Tap Enable Restrictions and create a passcode for Restrictions. Don’t forget this passcode. In the future, you’ll need your Restrictions passcode to change your settings or to turn off Restrictions. Also make sure your kids don’t know what it is. Kids are sneaky and smart! If you lose or forget your Restrictions passcode, you’ll need to erase your device and then set it up as a new device to remove the Restrictions passcode. Restoring the device using a backup won’t remove the passcode. Tap Enable Restrictions, then enter a new passcode. To see which apps and features you can restrict, go to Settings > General > Restrictions. Here you can turn on or off restrictions for the listed apps and features. If an app or feature is on or if there’s a checkmark next to it, anyone using your device can use that app or feature. Otherwise, no one can use that app or feature. If you specifically want to block explicit content, ensure that the Music and Podcasts setting is set to Clean. Explicit content from iTunes will still be shown but is greyed out and cannot be played. 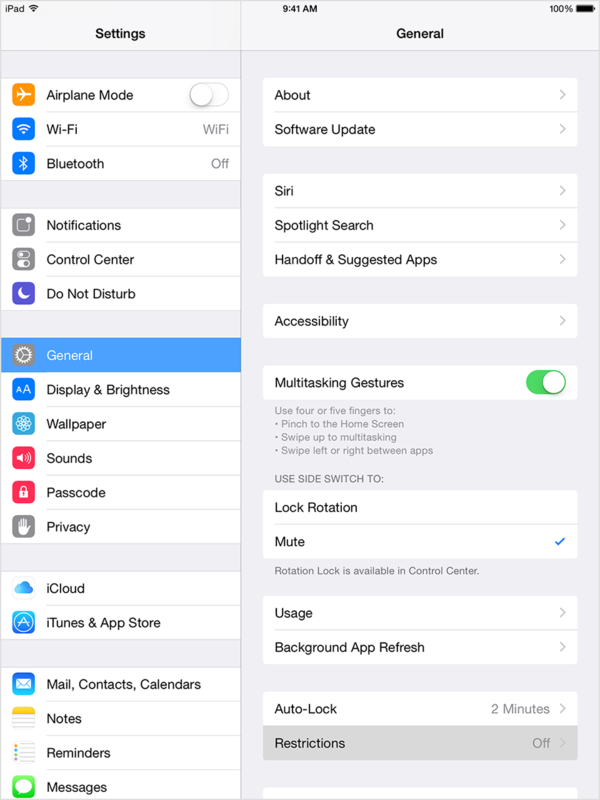 Please note that ONLY applications that honour the IOS restrictions setting for content will block explicit content. Spotify, Symfy, Tidal, Google Music etc. does not honour these settings but may have settings in the applications that allow you to restrict content. Businesses sometimes use profiles which can turn on restrictions if your device is managed. To find out if your device has a profile, go to Settings > General > Profiles. Contact your company administrator or the person who set up the profile for more information. If you don’t use Touch ID for paid and in-app purchases, you can choose between two options for how often you need to enter your password for these purchases. You don’t see an app on the Home screen (like Safari, Camera, or FaceTime). You can’t use a certain feature or service (like Siri or Location Services). 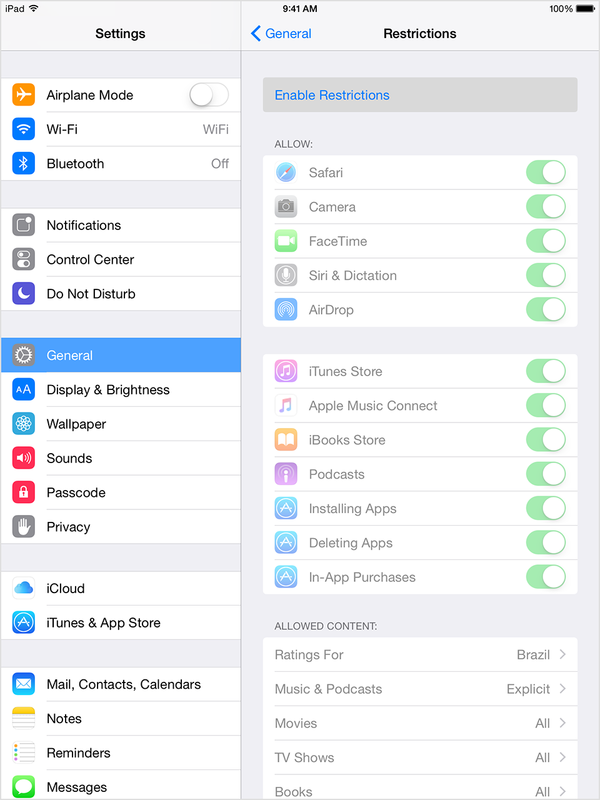 You see that a setting is missing or dimmed (like Mail, Contacts, and Calendar; iCloud; Twitter; FaceTime). 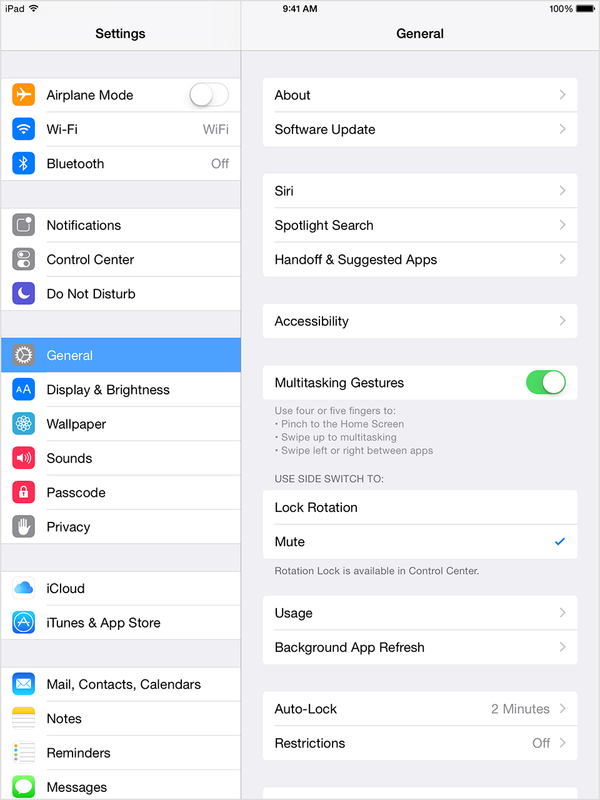 If you’re missing an app or feature, try turning Restrictions off. If you lose or forget your Restrictions passcode, you’ll need to erase your device and then set it up as a new device to remove the Restrictions passcode.